Our aim is simple: To create great sustainable homes and life experiences for people living with disabilities, through connecting families and communities. The Supporting Independent Living Co-operative (SILC) was created in September, 2016, to assist NDIS participants and their families to establish family-governed homes in a natural setting and to facilitate access to the community, education and employment. 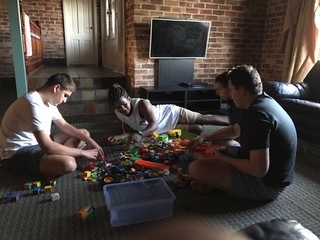 SILC acts as a hub, by connecting NDIS participants, families and carers to establish their own family-governed homes for people with a disability. Advocating on behalf of the SILC community about issues that affect you, for example, housing under the NDIS. Yes. SILC is a registered charity with the Australian Charities and Not-for-Profits Commission (ACNC) and a Public Benevolent Institution (PBI). SILC also has Deductible Gift Recipient (DGR) status, which means any donations made to SILC are tax deductible. Why are we focusing on people with very high needs? Families have told us that often their sons and daughters with high support needs get left behind in the planning and thinking about independent living. Under the NDIS we have the chance to change this and support families to create great sustainable homes in a natural setting, with the staff of their choosing and in a location that feels like home. Our focus right now is to support people with a significant functional impairment and/or very high support needs under the NDIS. SILC is currently in Sydney, NSW and aiming to expand to Melbourne, Victoria by the end of 2018. SILC was started in Sydney by a small group of families who wanted to assist other people with a disability under the NDIS, to live independently. SILC is planning to expand into Melbourne, Victoria following the roll-out of the NDIS. You can read more about the NDIS and when it’s coming to your area here. What if I live outside these areas? You can still be part of the SILC community. Over time we will grow our presence in other areas. In the meantime, tell us what your needs are through the General Inquiry form below. Starting to think about a home for yourself, or your family member with a disability, can be exciting. But it can also be daunting. Who to live with? Should you rent or buy? Will the NDIS funding pay for everything? What if it doesn’t work out? Is a family-governed housing model right for you? Here are some questions and answers that might help you on your journey. SILC uses the term ‘resident’ in all of our documentation to refer to individuals with a disability who are living in a house together. How do we get money to get started? Service Providers typically receive funding by invoicing Participants for services they have received. There will normally be a lag between when the Service Provider starts paying employees and other costs and when money can be claimed from NDIS by Participants and then the Participants pay the Service provider the amount invoiced. Service Providers need to have sufficient cash to cover expenses during that period. Start up costs for a new residential service would typically include putting up a rental bond, paying a month’s rent in advance and paying the first month’s salaries and other expenses. The amount will vary from residence to residence but is likely to be in the order of $50,000. If there are delays in accessing NDIS funding (perhaps because of problems with the portal) the startup capital could be two or three times this amount. What is the optimal number of housemates? The optimal number of housemates depends on the individuals. PaRA Co-operative found that three was the best number. NDIA considers more than four too many. There are significant economies of scale of having more people in the house – rent and other costs are shared. Wages paid to staff will make up most of the costs of operating the service. To the extent that less staff members per housemate works, there can be significant savings. There can be social benefits for housemates and staff from having more people. However, the number of rooms is a constraint. It is quite hard to find houses with more than three or four bedrooms and it’s good to have more than one living room so all housemates don’t need to be in the same room for a lot of the time. What is the optimal number of workers? This also depends on the needs of the housemates. Some individuals require two on one support some of the time. Others function well with shared support for some of the time. There needs to be enough staff to cover all shifts including extra shifts when staff members are on leave, for example, or clients are at home sick or when their day programs are closed. SILC finds that fewer staff facilitates good understanding with housemates and between staff. There can be substantial benefits in retaining staff members long-term. This is more likely with a small number of staff. However, there will inevitably be some staff turnover and it is desirable to have sufficient staff to avoid dislocation when someone leaves. Should we rent or buy a property? In practice, all NDIS Participants rent. However, there could be a relationship between the owner of the property and the tenant. The NDIS scheme assumes that rent will be paid out of the resident’s Disability Support Pension (DSP). Further, Accommodation Providers are not permitted to charge a participant more than 25% of his or her DSP plus 100% of his or her Commonwealth Rental Assistance. However, in many cases there will be a gap between market rents and 25% of DSP + 100% of CRA. Renting from a landlord who is a member of the general public involves risks of being displaced at the expiry of the lease and having the rent increased beyond the Participant’s capacity to pay. Participants are better off if the premises is owned by themselves, a family member or an Accommodation provider that will charge affordable rent and guarantee security of tenancy. Having good staff is essential for the success of a service and retaining staff for extended periods is important, especially if the person has a disability such as autism when ability to understand and communicate and provide consistency can be vital. Some SILC houses recruit staff by word of mouth - people who were known to the parents because they had worked with their children at school, day programs or respite, or who were recommended by existing staff. Most SILC homes advertise on recruitment platforms such as Care Careers and Ethical Jobs. Hire Up offers a service to match staff to people with disabilities. How does a Service Provider receive money from NDIS? In the past, Service Providers received 'block' funding from state governments. The money was paid directly to Service Providers in advance. Now with the NDIS, Service Providers are required to enter into a Service Agreement with the Participant and to send invoices to the Participant. Self-managing Participants can claim against their Plan through the NDIS portal. Typically, NDIS will pay the money into the Participant’s bank account and the participant then pays the Service provider. Agency-managed Participants can arrange to have NDIS pay money directly to the Service Provider. Plan-managed Paticipants use a third party who recieve invoices and pay Service Providers on behalf of the Participant. What insurance cover do we need? Workers compensation insurance, public liability and third party person (motor vehicle) are compulsory. Service providers typically also take out professional indemnity, comprehensive (or at least third party property motor vehicle) and home contents insurance. The owner of the property would also usually have Home Owner’s insurance. The board may insist on the Service Provider having Directors and Officers insurance cover. PaRA Co-operative uses Allianz for workers compensation insurance. Premiums can vary substantially depending on claims history. Allianz charges about 3.5% of salaries. PaRA Co-operative has $20,000,000 public liability insurance, $2,000,000 professional indemnity and $1,000,000 volunteers personal accident insurance. How do we design a staff roster? In most cases there will be sleepover shifts or awake shifts. The roster will need to allow for staff/housemate ratios at different times depending on the needs of the individuals and the capacity of the Service Provider to pay them. Staff/housemate ratios will depend on the needs of the housemates and the tasks they are required to perform. Rosters also need to 'work' for the employees who may have study or other time commitments. It may be necessary for the roster to rotate on a fortnightly or four weekly basis. Be prepared for the roster to be flexible. Staff will take leave and may need/wish to change their hours from time to time. It is best if regular staff members can cover gaps in the roster while other staff members are on leave. However, it is probably worth having one or two casuals who can cover absent staff. On occasions, replacements may need to be found at short notice. Parents may be able to remove their children from the service (to the family home) for short periods if necessary. SILC may be able to assist with preparing a roster for your service. Xero has an add-on application that allows staff and parents to see and change the roster. I’ve read that each SILC home has a Board. How often does the Board meet? This is at the discretion of the board but should be as often as necessary. When the organisation is new and setting up new policies and procedures the board might meet monthly. Once things have become established the frequency of meetings might be reduced to every two months. When do we hold Team meetings? As with board meetings, team (staff) meetings should be held as often as needed. In the early stages of a service or when there are a lot of new staff members it is likely to be appropriate to hold meetings regularly. It may be difficult finding times that suit all staff members. During the day when housemates are at work, attending study or day programs will often be most convenient. In any case, all employees should receive minutes of team meetings and have important issues explained to them in person. Until 2012, each state had separate laws governing co-operatives. The National Co-operatives Law has replaced the various state legislations, but registration continues to be done through state registries. In NSW, the registry which is based in Bathurst comes under the Department of Fair Trading. The Victorian equivalent comes under Consumer Affairs Victoria. Our experience has been that the process of registration is quicker and easier in Victoria than in NSW. The Business Council of Co-operatives & Mutuals (BCCM) is advocating to improve the registration process in NSW. BCCM is a key partner of SILC. Distributing co-operatives also require a Disclosure Statement. Do we need a Service Provider and how much should we pay them? NDIS funding is conditional on compliance with National Disability Service Standards and other laws and regulations that govern businesses. SILC will be able to act as a Service Provider for Corporate Members. If you use SILC as Service Provider the board of your corporate member will need to adopt or vary SILC’s policies and procedures and ensure they are complied with. Corporate members will normally undertake governance and often many other elements of the service themselves. Some corporate members may want to register as an NDIS Service Provider. It requires having a wide range of policies and procedures in place and obtaining Third Party Verification that the Service Provider complies with State (until 2018) and National Disability Service Standards. Should we use accounting software such as MYOB or Xero or use spreadsheets? SILC uses Xero accounting software and recommends it to corporate members, but members should choose how they wish to account for financial transactions. Who does household duties such as cooking, cleaning, washing, ironing, gardening, garbage or shopping? These can be outsourced. SILC's policy is for staff members to undertake these duties as part of their regular shifts but to involve/support housemates in as many tasks as they can safely perform. What use can we make of volunteers? Volunteers from family, corporate or community groups may help with tasks such as gardening, painting and clean-ups. SILC may be able to help corporate members access corporate or community groups willing to provide volunteer help. Most SILC homes designate responsibilities to one of its employees with a designated back-up person and pays an allowance to establish and maintain equipment, software and electronic records. It may be possible to outsource this task. How do we organise repairs and maintenance? Servicing motor vehicles, electrical equipment, gardening equipment etc. SILC requires parents to provide personal items including clothes, personal electronic equipment, bed linen and bedroom furniture for their child and to pay for the cost of repairs when their child caused damage. You may choose to pay an allowance to one employee with a designated back-up person to ensure that repairs and maintenance are done in a timely manner. This may involve direct action by the staff member or a parent or it may need a tradesman to be paid to do the work. What data should we collect on housemates? How do we let staff members go if we no longer need or want them? The board may delegate the role of hiring and letting go staff to a house manager or another person or group of people. The board has responsibility of ensuring this is done appropriately. How do incidents and grievances get reported and resolved? Incidents including damage to clients, staff and property need to be recorded. SILC has a template for recording such incidents and ensuring that steps are taken to minimise the risk of repeat occurrence. SILC has a template for reporting grievances and a policy for resolving them. SILC can play a role in providing independent mediation. What NDIS services does SILC deliver? We can also offer Plan Management and other non-specialist NDIS supports. Please make contact with us via the General Inquiry Form so we can discuss your needs and offer a tailored approach. What support is available under the NDIS? SIL - Supported Independent Living is a Core Support category service. It primarily covers the cost of paying support workers to support the Participant living in supported accommodation. The amount of funding depends on the ratio of staff to housemates as well as time of day and day of the week. Refer to pages 24 to 28 of the NDIS Price Guide. SDA - Specialist Disability Accommodation is Capital Support. It provides money to help build or purchase suitable accommodation for people with significant disabilities. Accommodation providers are typically different from Service Providers (providing SIL services). The SDA price is a contribution towards the cost of owning and maintaining an SDA dwelling. Refer to the SDA Price Guide. What is SDA and SIL funding? SIL - Supported Independent Living is a Core Support category service. It primarily covers the cost of paying support workers to support the Participant living in supported accommodation. The amount of funding depends on the ratio of staff to house-mates as well as time of day and day of the week. Refer pages 24 to 28 of the NDIS Price Guide. SDA - Specialist Disability Accommodation is Capital Support. It provides money to help build or purchase suitable accommodation for people with serious disabilities. Accommodation providers are typically different from Service Providers (providing SIL services). The SDA price is a contribution towards the cost of owning and maintaining an SDA dwelling. Refer to the SDA Price Guide. What is the assessment criteria for SDA? The NDIS is based on an individualised planning process that determines what is considered reasonable and necessary and what will be funded in a participant’s Plan. So, the first step in determining if a person will be eligible for SDA or other funded supports, is to go through the planning process. What types of participants will receive SDA? - Very high support needs. See pages 9-10 of the Rules for more detail. What age can a participant receive SDA? It is expected that NDIS Participants under the age of 18 years will not be supported by SDA. The Explanatory Statement (page 5) refers to the family being responsible for a participant child and children and young adults residing in the family (parental) home until a natural life transition point where this is possible. (Refer to the Explanatory Statement page 5). What options are there for housing supports if a person is not eligible for SDA? The majority of NDIS participants, roughly 94%, will not qualify for SDA. It is expected that most people will live in their own homes, the private rental market, shared living in the community, public housing, or another model. The NDIS could fund reasonable and necessary supports in a person’s Plan to enable them to live independently. An example of this might be funding for Specialist Tenancy Supports, to enable participants to find and maintain a tenancy in the private rental market, for example working with real estate agents to find appropriate housing and maintain tenancy obligations. Are there priority groups of people for SDA? Yes. In general, people currently residing in SDA type accommodation e.g. group homes, will be prioritised for SDA. Other priority groups are young people in nursing homes and people with ageing carers. Every situation is unique and the Planning process will identify what supports could be funded. What housing options are there for people currently living in respite homes, interim emergency care and other models not classified as 'group homes'? Governments are considering options for everyone that is currently residing in these types of accommodation. SDA has commenced now for priority groups of people (see above). It is expected that new SDA growth will occur from 2018 – so this would include people who are not currently living in a supported accommodation arrangement. How many people with SDA funding can live in a parcel of land? The Rules explicitly describe density restrictions - how many people with SDA funding can live on a ‘parcel of land’. There are different density restrictions depending on whether it is a new build, existing stock and the number of people that each dwelling can house. - Dwellings with 3 or more residents can have no more than 10 or 10% of people with SDA in their Plans – whichever is the greater. - Dwellings with 1 or 2 residents can have no more than 15 or 15% of people with SDA in their Plans – whichever is greater. - Intentional Communities – a combination approach – see the Rules. See pages 28-29 of the Rules. Can an existing home that is modified attract SDA funding? Possibly, but it would be dependent on a participant’s eligibility for SDA funding, what modifications have been done, and when. The house would need to be enrolled as an SDA dwelling and comply with the SDA building requirements. These requirements are quite strict and may be difficult to achieve for most existing dwellings and / or costly. The Rules explicitly outlines restrictions on enrolling a SDA property where complex home modifications or home modifications have been undertaken and funded by the NDIS – see Page 25. What options are available for home & building modifications under NDIS? The NDIS may provide funding for home & building modifications. Modifications are also considered with the context of SDA dwellings. Does a home need to be approved as a 'group home' by the local council? Local Council planning requirements would need to be considered for any dwelling modifications or new builds. What is required for an owner of a 'group home' to become a NDIS registered provider? Does a registered service provider have to providing support services in the home or can families self manage? Families who self-manage can choose to use service providers who are not registered with the NDIS if they wish. What support is there to work with participants (or families) to find each other so they can potentially share a house? SILC will support NDIS participants to connect and explore various housing options, by using Support Coordination. Support Coordination is generally included in Plans to explore housing options. You can also check out our website under 'Members - Community Noticeboard'. This is where our members advertise if they are looking to find other people in their area to share a home with or start a discussion about housing. Can participants own their own home and effectively self-provide SDA? Yes. A participant with SDA in their Plan can own their own home and it can be paid for with SDA funding. Will there be financial incentives (i.e. reduced or no stamp duty) for people building new homes or apartments for people with a disability? SILC is currently advocating to Governments about options that could incentivise people to invest in disability housing.